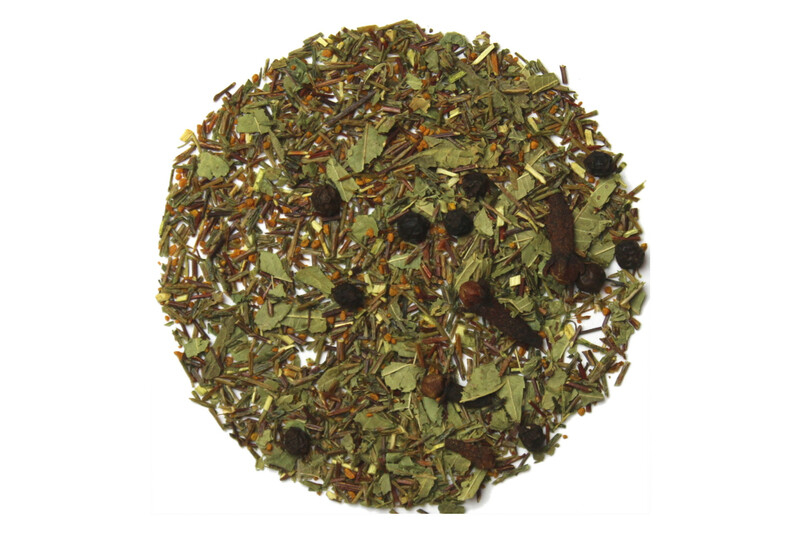 Rusty Roots is an herbal and rooibos blend that brings a wide range of classic medicinal herbs into one cup of tea. The organic green rooibos, organic whole cloves, organic lemon mrytle, organic whole pepper, and organic turmeric will give you a truly unique experience when brewing. Rusty Roots is similar in flavor to a traditional Chai tea but with a low caffeine content. What an interesting blend. At first the strong yellow color and stain potential of the turmeric put me off, but this tea actually became one I really looked forward to brewing. It’s a comforting sort of brew that has a unique flavor that is not dominated by any one of the spices or herbs and is tied together nicely by the rooibos tea. Hard to compare to another tea since I can’t think of another like it! And I mean that in a good way! When I read the ingredients for this tea I was thinking it was going to be an odd mixture of tastes, maybe even broth like, but to my pleasant surprise it was delicious! Definitely not sweet but a very satisfying drink. The name caught my attention, so I had to try this one first. It's a good all around tea. Definitely glad I got the opportunity to try it. Reminiscent of a chai tea, but with a bit different flavor. Not as strong of a spice flavor as some chai, which I liked. Low caffeine is also a plus.